but first, let's start with a stamp set. What a lovely lovely stamp set, isn't it? Here is my 1st take on it. With silver-embossing, it easily look very polished and trendy!!? I wanted create a nearly symmetrical floral frame. The two long leafy vines are perfect for this. I think they are perfect for stamping a large area, such as a gift bag! I love that this set comes with various size of small dotty images. I hope to come up with more versions with this stamp set. 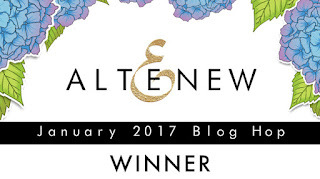 The lucky winner of Altenew January Release Blog Hop (see here)! Congratulations, Tracie! Please e-mail me becr8ive2@gmail.com for your prize! SALES over Simon Says Stamp. Here are the new stuff. The coupon code "HEART" (takes $5 off) still works! Sales over Altenew are still available. Here are the new stuff. Lovely framed effect! BEAUTIFUL!! My new inks and new to me stamp set from Altenew should be arriving soon. So excitrd to play with thrm! Lovely card. You are so right--this stamp offers a lot of versatility. 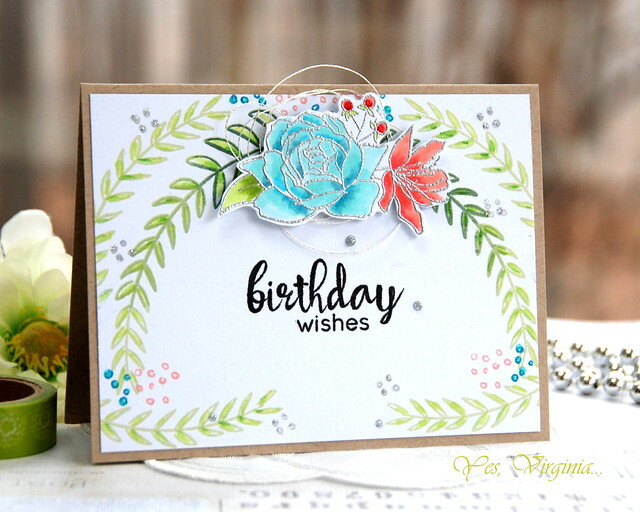 I love the silver embossing and the flower colors are great. The dots, my goodness so useful. Brilliant. This is beautiful, Virginia! Love the colors! That set is definitely going on my wishlist--love your beautifully crafted card, Virginia! 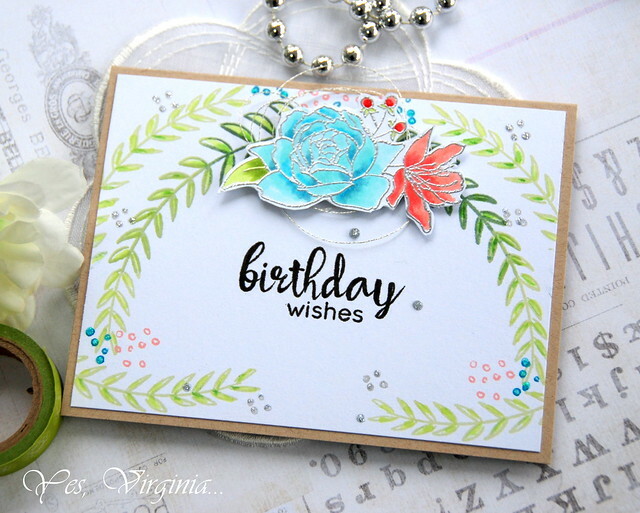 Just love your floral swag, Virginia - such pretty colors and embossing!! All I can say Is gorgeous, gorgeous, gorgeous!! 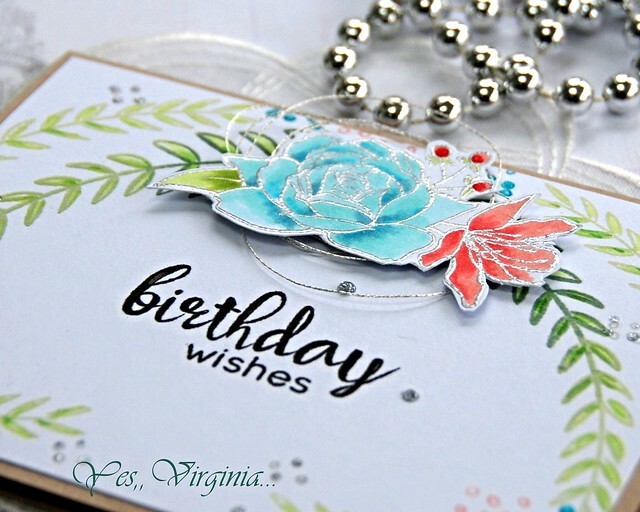 Gorgeous card, Virginia! Love the silver embossing, too. Congrats to Tracie! beautiful card Virginia. This looks like a very versatile set. LOVE the embossed flowers, colours and design! 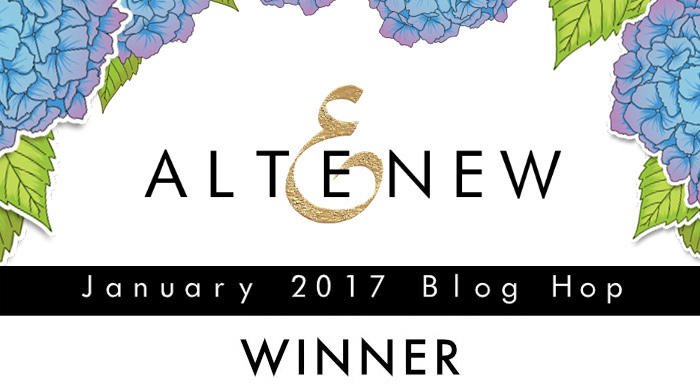 CONGRATULATIONS to Tracie on winning too! Lovely card! And congratulations Tracie! Love the embossed, fussy cut flowers on those beautifully stamped leaves. A stunning card Virginia. So gorgeous!